September 08; A substantial 71% of Pakistan’s population says that holding Local Government elections nationwide are somewhat to very important. Only 27% of the country’s population believes that holding these elections is not very important or not important at all. On the other hand, 65% of Pakistanis believe that elected Local Governments are somewhat to very important in solving the problems faced by Pakistani Citizens. Only 32% Pakistanis asserted that elected Local Governments are not important in resolving the problems faced by citizens. These public views are part of a Nationwide Public Opinion Poll by PILDAT on assessing citizens’ views on Quality of Democracy in Pakistan during the 1styear of after the May 2013 General Election. The survey results are released from a two-part PILDAT survey covering separately Quality of Governance and Quality of Democracy. While the public opinion scores on Quality of Governance survey were released on September 02, 2014, the public opinion poll scores on Quality of Democracy are being released today. The two-part public opinion survey was commissioned by PILDAT upon the completion of the 1st year of National and Provincial Assemblies and Governments in office in May 2014 to gauge public opinion across the country on quality of governance and democracy. The nationwide poll was conducted during July 16, 2014 to August 6, 2014. The Nationwide Poll was conceived and commissioned by PILDAT and conducted by Gallup Pakistan. Of particular significance is the public’s positive rating on the Overall Quality of Democracy Indicator. This holistic indicator measures the public’s level of satisfaction, as well as their assessment of how well democracy is functioning in the country. This positive NPR is reflective of the growing and deepening attachment that the people of Pakistan have begun forming with a democratic system of governance. This summary report presents an analysis of the public opinion obtained on core indicators on quality of democracy. The respondents for the survey included 3065 citizens from rural and urban areas from all the four provinces of Pakistan. They represented a cross section of young and old, middle and high income. The fieldwork for the report was done face to face in respondents’ homes. The sample is also based on a cross-section of various age, income, education and language groups of the population. Error margin is estimated to be approximately +3-5% at 95% confidence level. Provincial scores from Balochistan and KP are somewhat similar in their positive and negative ratings on Quality of Democracy questions. Overall, people from Balochistan and KP hold positive opinions of the quality of democratic functioning nationwide. Respondents from both provinces registered their highest NPR on Trust in Political Parties (+64% in Balochistan, and +61% in KP). This strong positive NPR is indicative of the robust trust that political parties in each province have been able to generate. Similarly, people from Balochistan and KP were equally positive in their assessment of the Overall Quality of Democracy in the country; Balochistan, with the NPR of +54% in fact provides the most favourable opinion on quality of democracy, followed by +31% in KP. Interestingly, the positive NPR by the people of KP (+31%) for the overall quality of democracy in the country was higher than that of Punjab (+19%). Sindh has emerged as politically the most pessimistic jurisdiction in the country. In this Quality of Democracy assessment, the people of Sindh have given negative NPRs to democracy indicators nationwide. Punjab has emerged as the province with the highest number of positive NPRs for the democratic system in the country. The people of Punjab gave the current democratic system positive ratings on 9 out of 11 assessed indicators. The people of Punjab gave the highest NPR to Trust in Political Parties (+32%). The only negative NPR from the province was recorded on Effectiveness of the Bureaucracy (-8%). A substantial 67% of the country’s population believes that democratically elected governments constitute the best system for Pakistan. Crucially, the popular appetite for another Army rule in the country remains low as only 19% Pakistanis see another military rule as the best system for the country. While 63% of all Pakistanis believe that the General Election held in May 2013 was somewhat to completely transparent and fair, 37% respondents see the May 2013 Election as somewhat rigged to completely rigged. An overwhelming majority of Pakistanis, 85% believe that it is critical that the Election Commission of Pakistan’s functions need to be reformed and reconfigured. In comparison, 67% people felt the need for electoral reforms in a poll upon the conclusion of 100 days of National and Provincial Governments in September 2013. This indicates that the movement for electoral reforms has made significant impact during the past 9 months. The scorecard shows Net Performance Ratings (NPR) on core democratic indicators nationwide. Negative Scores reflect performance evaluations where the negative assessment outpaces positive evaluation. Similarly, a positive NPR is indicative of an evaluation where the positive assessment is greater than the sum of negative assessment. Over the last year, the Pakistani public has been able to see glimpses of the Federal Government’s policy agenda and the state of democracy in the country. Crucially, the democratic transition from the PPP Government to the PML-N Government was a landmark event in the country’s history. This peaceful and stable transfer of power from one democratic Government to another has given the Pakistani public an opportunity to begin assessing and engaging with democratic institutions and functions in the country. Moreover, as the country’s democratic experience deepens, the people of Pakistan are beginning to understand and analyse the core indicators and norms that democratic Governments must adhere to, in order to make democracy more transparent, legitimate, and effective. The difference in positive and negative NPRs on specific indicators shows that the people of Pakistan support the overall democratic architecture that has been built over the last few years. Specifically, the people of Pakistan are happy with the overall democratic dispensation, and favour democratic governance. However, specific indicators of democratic functioning are still rated negatively. This implies that the people of Pakistan, while favouring the democratic infrastructure and overarching democratic norms in the country, still wish to see improvement on the operational aspects of democratic governance. Public opinion on first year of democratic performance indicates that the Pakistani public has clearly distinguished between strengths and weaknesses of the democratic system. The people of Pakistan have begun forming linkages with their favoured political parties and their political agendas. The current democratic order in the country gained its highest positive NPR on Trust in Political Parties (+33%). This signals a welcome change in Pakistan’s socio-political discourse and politics. Pakistan’s political parties, the principal institutions and agents of democratic functioning, norms, and practices in the country, enjoy strong public trust and confidence. This development augurs well for the future of democratic evolution and probability of democratic consolidation in the country. In contrast, the lowest NPR on the current democratic system in the country was registered on Effectiveness of the Bureaucracy (-21%). This high negative NPR is indicative of the lack of transfusion of independence, democratic accountability and transparency in the civil services in Pakistan. Critically, the machinery of governance, i.e., bureaucracy, is rated negatively by the people of Pakistan. This implies that while democratic norms and architecture are strengthening in Pakistan, the tool for delivering effective democratic policies remains ineffective. Specifically, the indicator assessed here analyses the impartial, objective, effective, and subordinate functioning of Civil Services under the Constitution and laws of the State. The negative NPR on this indicator is reflective of the need for democratic Governments in Pakistan to undertake bureaucratic reforms in order to deliver effective and improved governance to the people of Pakistan. The best and worst rated Quality of Democracy Indicators here are also indicative of another important emerging feature of Pakistani politics and democracy: while the people of Pakistan have formed a confident and trust-based link with their political parties, thereby indicating a commitment to democratic norms in principle, the democratic Governments need to improve their performance via reforming the bureaucratic machinery in order to bring positive and palpable reforms to the people of Pakistan. The scores given in Table 3 compare the National and Provincial scores on the Quality of Democracy at the Federal level. This comparison shows how each province views the current democratic dispensation nationwide and its performance on core democratic indicators. Table 3 provides an insight into how residents in each province of the country view the overall functioning and performance of democracy in the country. Khyber Pakhtunkhwa and Balochistan differ in their highest negative assessment of the Quality of Democracy Indicators. In Balochistan, the most negative NPR was registered on Transfer of Powers at the Provincial Level (-45%; a perennial and somewhat legitimate concern of the people of Balochistan), while in KP the most negative NPR was registered on Effectiveness of the Supreme Court (-54%). An important distinction here is the slightly positive NPR on Effectiveness of the Federal Cabinet (+4%) recorded in Balochistan. This score supports the idea that the people of Balochistan are increasingly becoming more comfortable with the democratic set-upat the Federal level, and are fully supportive of retaining a democratic political system in the country. The lowest NPR in Sindh was recorded on Respect for Human Rights (-55%). 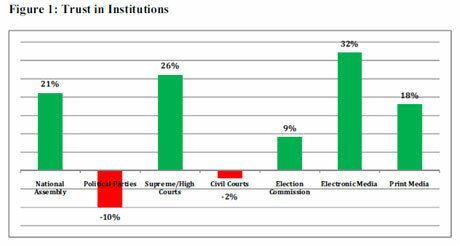 Similarly, Effectiveness of the Bureaucracy (-51%) and Sovereignty (-43%) were rated poorly by the people of Sindh. The only positive NPR was registered on Independence of Media (+7%) and Trust in favourite Political Party (+11%). This pervasive and prevailing negativity in Sindh must alert the national and political leadership to the resentment and pessimism brewing in the province. The people in Sindh are deeply dissatisfied with the current system of political governance, as well as the actual delivery of governance in the province. However, the silver lining remains in the trust quotient still attached to the political parties operating on the provincial and national level. Despite the overall negativity on most quality of democracy indicators, the people of Sindh are still expectant that political parties will successfully translate democratic support from the people into effective and transparent improvements in governance. Punjab has emerged as the province with the highest number of positive NPRs on democratic system in the country. The people of Punjab gave the highest NPR to Trust in favourite Political Party (+32%). This rating can be taken as evidence for strong support for the current system of democracy, as well as its qualitative performance over the last year. The only negative NPR from the province was recorded on Effectiveness of the Bureaucracy (-8%). Given the negative NPRs on this indicator from all four provinces, including Punjab, democratic governments at the centre and in provinces should invest their focus and energies into reforming the bureaucratic institutional infrastructure in the country. 47% Pakistanis believe that the country is getting its democratic evolution mostly on the right track. This proportion of respondents rated the current democratic system in the country between 6 and 10 (on a scale of 1-10; a score of 1 being “Highly Undemocratic” and a score of 10 denotes “Highly Democratic”). 53% of the country’s population rates the current democratic system more apprehensively by rating the current democratic system in the country between 1 and 5 (out of 10). Respondents from across Pakistan were asked to assert their level of trust on major national institutions. The data presented in Table 4 provides an indication of the most and least trusted institutions in the country. Pakistan’s burgeoning electronic media is seen as the most trustworthy institution, with a positive Net Rating of 32% – 64% Pakistanis stated that they trusted the electronic media “a lot” to “somewhat”. Similarly, the Supreme and High Courts of Pakistan earned a strong positive rating of +26%, while the National Assembly also generated a strong positive rating of +21%. The other important arm of the media industry – print media, also earned a solid trust rating of +18%. The Election Commission of Pakistan, currently embroiled in the middle of the national political crisis, was able to earn a positive rating of +9%. In contrast to the robust trust embedded in the higher courts of the country by the people of Pakistan, subordinate civil courts in the country managed a negative rating of -2%. Political Parties in Pakistan in general as an institution received the lowest rating of the institutions covered in this poll: -10% although the rating for the favourite political party registered a highly positive response. A substantial 63% of all Pakistanis believe that the General Election in 2013 was somewhat to completely transparent and fair. Only 37% respondents see the Election as somewhat rigged to completely rigged. The overwhelming majority of Pakistanis, 85%, believe that it is critical that the Election Commission of Pakistan’s functions need to be reformed and reconfigured, while only 10% did not consider these changes necessary. In the context of the need for reforms and changes in the ECP, 30% Pakistanis believe that the next elections will be conducted in a much better fashion by the Election Commission of Pakistan. However, 26% Pakistanis have serious doubts about the Election Commission and believe that the ECP will fare worse in the next elections. 37% of all Pakistanis believe that the ECP’s performance at holding free and fair elections in the country will be no different in the future. The National Assembly of Pakistan’s performance is rated the best in terms of its legislative role in its first year. While 48% of the respondents saw the National Assembly’s legislative performance as “Good” or “Very Good”, 47% saw its functionality on this metric as “Bad” or “Very Bad”. The majority of the country (57%) viewed the National Assembly’s performance as “Bad” or “Very Bad” in carrying out oversight of the Executive. 38% of the country viewed the Assembly’s performance as “Good” or “Very Good”. A majority of Pakistanis, 51%, saw Prime Minister Nawaz Sharif’s attendance and participation in the National Assembly sessions over the year as “Bad” or “Very Bad’. However, a substantial 42% seem to rate this as “Good” or “Very Good”. Over the last year 53% Pakistanis saw the Federal Government failing in keeping good relations with its political opposition in the National Assembly, while 42% rated it as “Good” or “Very Good”.